Dr Joe Kosterich intends for the information on this website to only serve as a general overview on matters of interest. It is not intended to be comprehensive, nor does it constitute advice in any way. You should seek professional medical advice before acting or relying on any of the information displayed on this website. 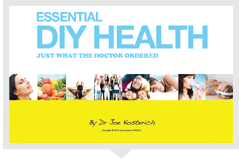 Subject to any implied terms that cannot be excluded by law, Dr Joe Kosterich, nor his employees, accept any liability for any loss or damage, suffered by any person, arising from the use of, or reliance upon, the information displayed on this website. By using this website, you agree to indemnify Dr Joe Kosterich from and against all actions, claims, suits, demands, damages, liabilities, costs or expenses (whether in tort or in contract including and without limitation or negligence) arising out of or in any way connected to your use of this blog. Do not duplicate or distribute without permission. This content is for informational purposes only. Dr Joe Kosterich does not accept any liability for information displayed on any website that is linked to this website. Please read my Disclosure Notice.